William came in first in his age group! A new Personal Record for William, finishing his 15th marathon in 3 hours and 43 minutes! William came in 2nd in his division! Another 1st place in his age group for William, and 7th overall! William finished 1st place in his age group for the 25K run! Read our blog post on William's 1st ultramarathon! View KEYE's coverage of William's preparation for this run. 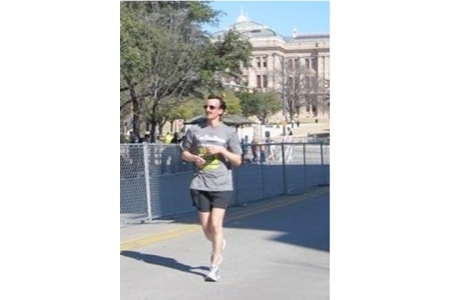 View KEYE's coverage of Will's preparation for his 12th marathon. Photo below. Read our wrap up of Will's run, his 11th marathon. Personal best for Will at 03:47! Way to go! Photo below. Coming in at 03:54:11, Will finished 661st out of 3,954! Check out our team page for this event. Chase, Dennis, and Jennifer joined Will in this yearly fundraiser for disability rights! 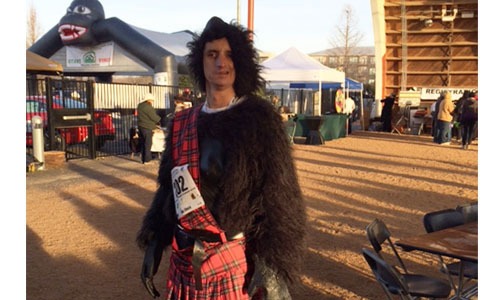 The Austin Gorilla Run is organized to raise funds to support the Silverback Gorillas, an endangered primate. 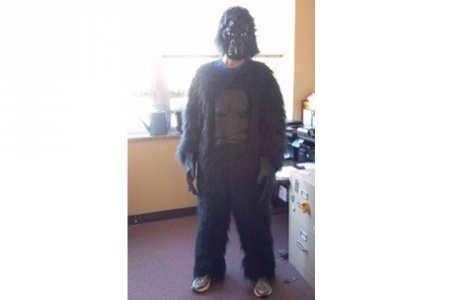 To show their support, runners wear gorilla suits and costumes during the event. William's gotten a lot of mileage out of his gorilla suit! Photo below. William finished 415th out of 2,622 runners. Not bad! That puts his marathon total at 8! William finished 8th overall, averaging a 6.48 minute mile. Not bad for the hottest part of the year! Read the full story of William's experience in Boston. Photo below. William's time qualified him for the world famous Boston Marathon on 2013! By now a tradition at CTD! William placed 10th overall and third in his age group. Movin' on up! Even though this 5k started at 8p.m., it was a very hot race. William averaged a 7:17 minute mile. Big thanks to Mary Roberts, his sighted guide. This is the shortest race William ever entered. He finished in less than six minutes, with a time of 5:56, but found the distance far too short. How he longed for a 5K! At this annual fundraising event, every participant has one hour to complete as many quarter mile laps as he or she can. Supporters of the ADAPT FUNRUN pledge a pre-set dollar amount for every lap the participant completes. Participants can complete the laps any way they choose. This includes walking, running, riding in a wheelchair skipping, and jumping rope. William and Dennis combined raised nearly $4,000 for CTD and ADAPT! That's right, William went from the Fun Run to the Bun Run on May 1, 2011! Laura joined him for this early morning event. William gathered a total of 15 students, and one teacher from the Texas School for the Blind and Visually Impaired to enter this 10k. Some ran, some walked, and everyone had a good time. 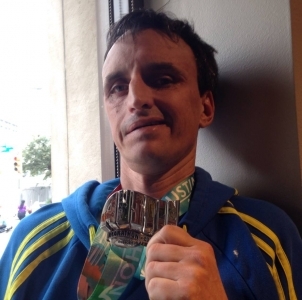 William's goal was to complete the marathon in less than four hours. He finished it in his fastest time ever: 3:50:23. William averaged a 7:14 minute mile, placing him third in his age group! Sighted guide Keith Wadsworth joined William for this post-marathon run. Good news- William's legs still worked! William's second marathon! With a finishing time of 03:55:00, he reached his goal of completing the marathon in less than four hours. All children need heroes, but children who have been neglected or abused need superheroes. CASA organizes the superhero 5k every year to raise funds for abused or neglected children. Runners are encouraged to wear the costume of a superhero, or create their own, to enter this race. The Lightning Laces alter egos included Strawberry Short Fuse (a.k.a. Laura Perna), Imitation Crab Man (a.k.a. Geoff Glass), and Sporkman (a.k.a. William), who was accompanied by Sighted Guide Man (a.k.a. Keith Wadsworth). CTD VISTA Laura Perna and member Geoff Glass donned their running shoes for thier first run with CTD's team. Photo below. Laura joined William for this annual 5K benefitting Austin Sunshine Camps. Photo below. At this annual fundraising event, every participant has one hour to complete as many quarter mile laps as he or she can. Supporters of the ADAPT FUNRUN pledge a pre-set dollar amount for every lap the participant completes. Participants can complete the laps any way they choose. This includes walking, running, riding in a wheelchair skipping, and jumping rope. 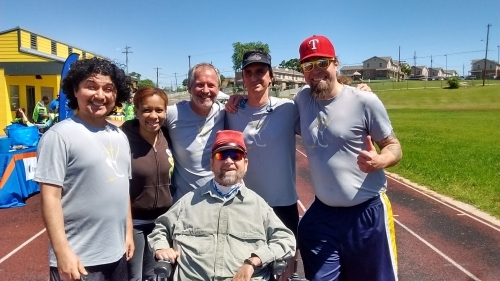 Several CTD staffers, including VISTA Dyana Limon-Mercado, Executive Director Dennis Borel, and regular runner William Greer participated in this year's event, benefitting both CTD and ADAPT! Photo below. William did a great job on his first marathon. He finished it in four hours and eight minutes (4:08:06), ranking him 1412 out of the 4039 people who finished the marathon. That's in the top 35%! Photo below. The maiden voyage for the ConTenDers: a 10k relay. Each team member- William Greer, Dennis Borel, Joe Plougher, and Chase Bearden- had to complete one fourth of the course, a 2.5-mile loop of Zilker Park. The weather turned cold and rainy, but all of the ConTenDers were very happy (and soaking wet) at the end of our first race. Photos below. Sept. 4, 2009. Zilker Relays. Chase Bearden (in the awesome racing chair) and Bethany Humble. Sept. 4, 2009. Zilker Relays. 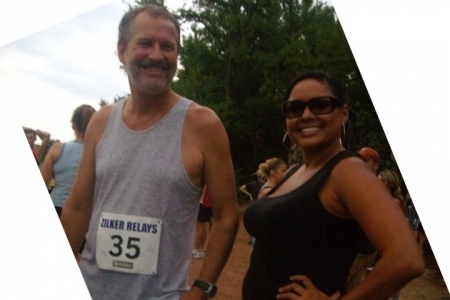 Dennis Borel and Dyana Limon-Mercado smile at the camera as though they haven't done the run yet. Sept. 4, 2009. Zilker Relays. The team- Joe Plougher, Dennis Borel, William Greer, and Chase Bearden- and supporter Bethany Humble take group shot at the end of the day. Feb. 14, 2010. 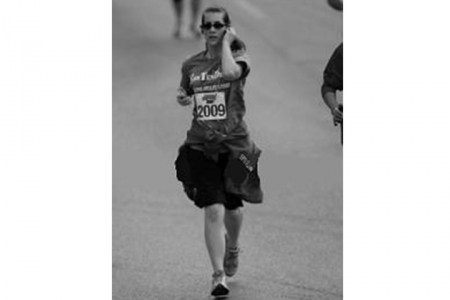 Austin Marathon. William Greer runs down Congress Ave. in front of the Capitol building. April 25, 2010. ADAPT Fun*Run. 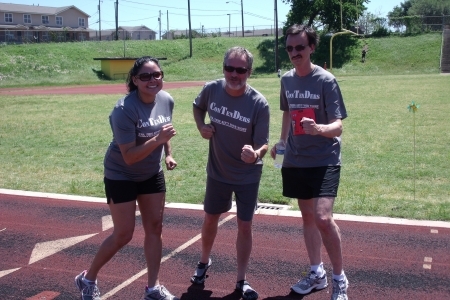 Dyana Limon-Mercado, Dennis Borel, and William Greer strike running poses on a track. May 2, 2010. Schlotzsky's Bun Run. Laura Perna adjusts her earphones as she runs. June 5, 2010. Austin Pride Run. 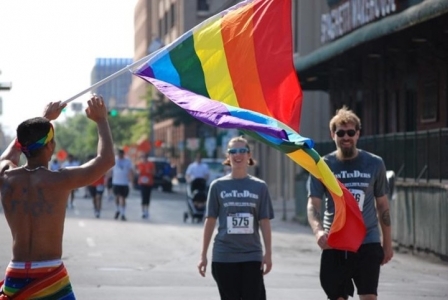 Laura Perna and Geoff Glass take a walking pace past a rainbow flag bearer. Jan. 21, 2012 & Jan. 19, 2013. Austin Gorilla Run. William never misses a chance to don his gorilla suit. April 15, 2013. Boston Marathon. 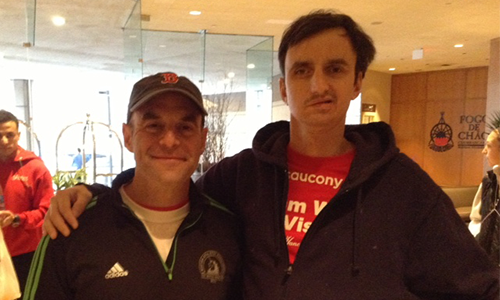 Sighted guide Peter Sagal and William Greer are ready for the most famous marathon in the US. Jan. 25, 2014. Austin Gorilla Run. This year, Will spreads some awareness about the little known Highlands Gorilla. Feb. 15, 2015. 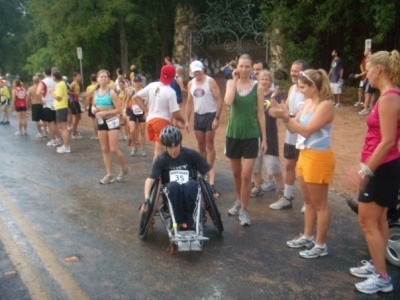 Will sets a personal best at the Austin Marathon. 3 hours, 47 minutes! December 12, 2015. 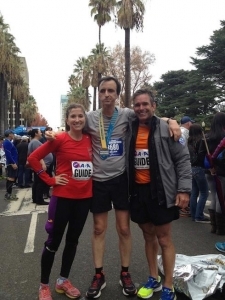 William Greer & his two sighted guides, Kirstin Van Steinwick and Dan Stretman, at the California International Marathon. April 2, 2016. 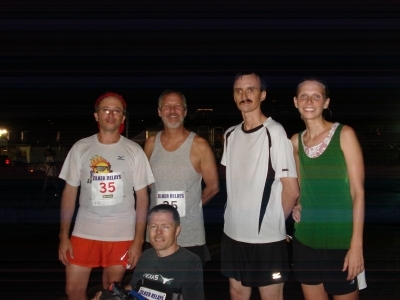 CTD supporters David DeLeon, Veronica Wright, Geoffrey Glass, and Gene Rodgers join CTD staff William Greer and Dennis Borel at the Fun Run. September 11, 2016. William Greer with sighted guide Steven at the Reveille 25K Trail Run.